If ever there was a match that brought with it a new era it was this one. 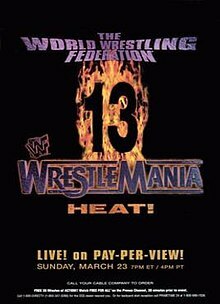 WrestleMania 13 could have been a big contender for the worst ‘Mania of all time. Nothing seemed to look “must see” on paper. The main event saw a heavyweight clash between Sycho Sid and the Undertaker. There is a reason that 13 is the only Wrestlemania in history to not sell out! A submission match between Bret “The Hitman” Hart and “Stone Cold” Steve Austin. Bret had been the WWF long time hero character Steve Austin was a bad guy. But this was 1997. The NWO had already happened in WCW and being a “bad guy” was now cool. As a result even during the introductions t0 the match Austin got great reception from the crowd. The match was billed as a submission match, but today we would call the match that followed as a “Street Fight.” There were chairs, ring bells, ring rails, and blood. Lots of blood. The Hitman beat down Austin to a bloody mess and locked in his signature sharpshooter. It created the iconic image of Austin passing out. In one night Austin became iconic. And Bret… He attacked after the bell becoming a bad guy. This wasn’t a shock turn WCW style. WWF had been building on Harts frustrations with the company for months. The good guy who once had no excuses would have reasons for his loss. The rivalry that followed between Austin and Hart was a classic. Hopefully the WWF will edit it in to one of those Network collections, because it is possibly Austin’s greatest rivalry, bar the McMahon one. Hart turned into a patriotic Canadian heel. One night in particular stands out. Canadian Stampede. We saw the newly reformed Hart Foundation (including a reunited Bret and Owen) take on Austin’s team (LOD, Golddust and Ken Shamrock). Those all American good guys were hated in Canada.